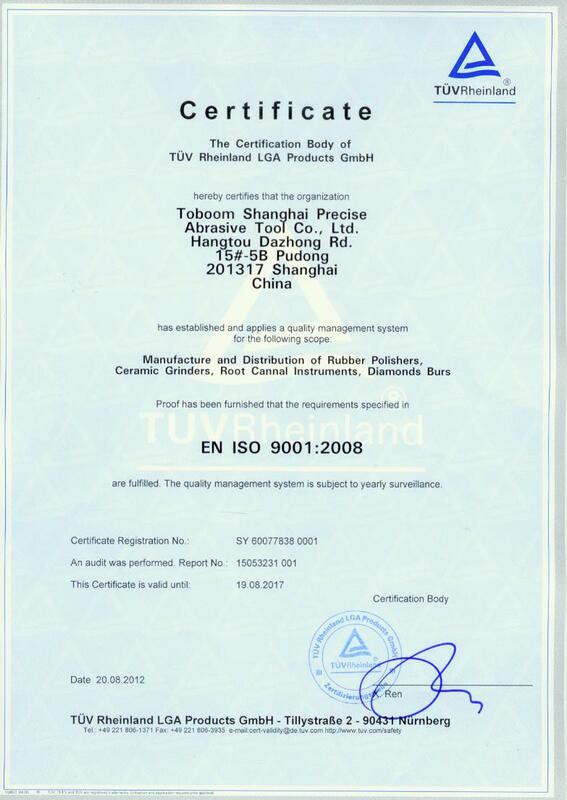 Company Overview - Toboom Shanghai Precise Abrasive Tool Co., Ltd.
6YRSToboom Shanghai Precise Abrasive Tool Co., Ltd.
Toboom Shanghai Precise Abrasive Tool Co., Ltd. was established in 2002, located in Pudong District, Shanghai City which is the largest sea port city in China. We are focusing on developing, designing, manufacturing and selling dental rotary instruments.There are one hundred staff members in our company, and fifteen of them are engineers, nine of them are special for quality management. We have a four thousand square meter manufacture plant, fifty sets of numerical control machines/equipment, and a complete production management/work/control system. 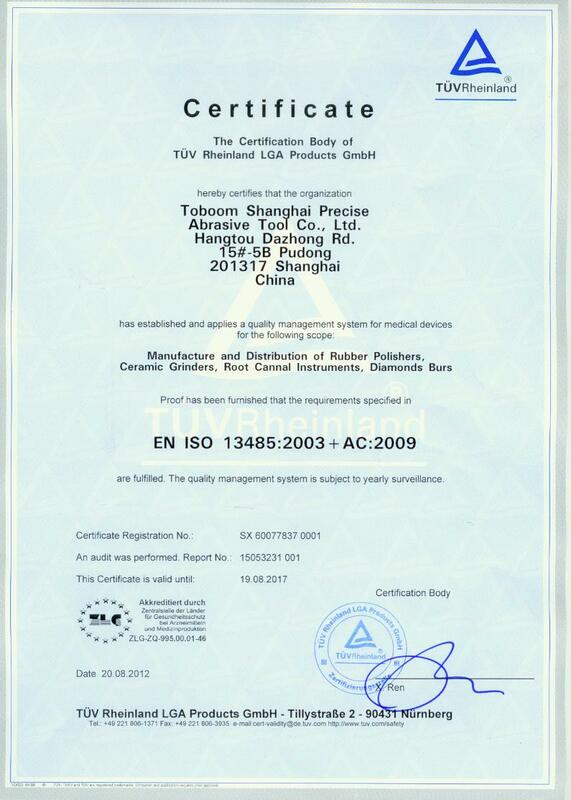 We have certifications as production license/product registration by SFDA and other international certificates such as ISO9001, ISO13485, CE0197, and FDA.Toboom Dental Co., Ltd. belongs to Toboom Shanghai Precise Abrasive Tool Co., Ltd., and is specialized in the international business of dental rotary instrument/dental consumptive material. 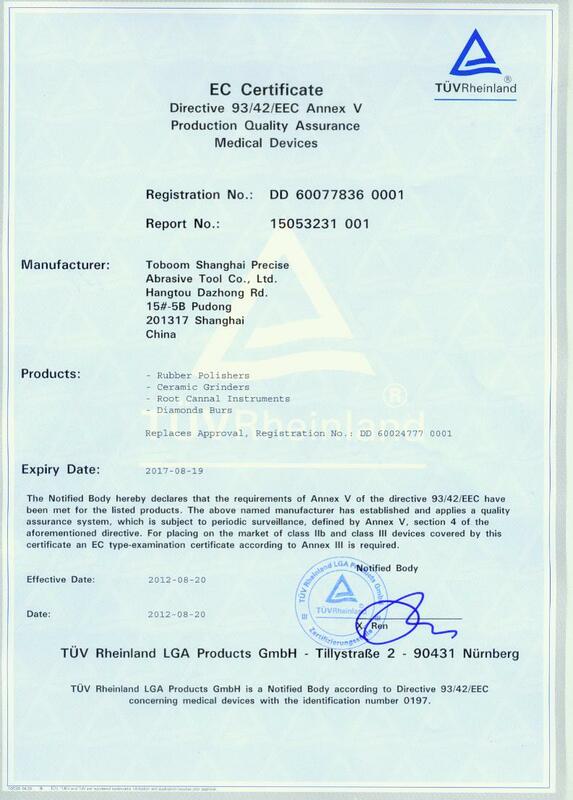 Our products are sold worldwide including America, Canada, Germany, England, Russia, Japan, Turkey, Egypt, Saudi Arabia, Brazil, Mexico, and many other countries. We hope to establish long cooperation with you and supply you with professional technology / manufacturing / purchase services including OEM services. All these services are based on our resources of professional research/design/production for dental rotary instrument field and our acquaintance for made in China resources. In order to ascend into international famous dental brand group, our staff will work using advanced facility with excellent performance, strive for perfection and keep improving. We are going to renew TOBOOM's business chapters, to continue TOBOOM glory.